I wanted something hearty since the soup and some crusty bread is all I'll be eating for dinner. And I'm a sucker for creamy chowders. No worries about the cream, though, since I make my soups creamy by pureeing some of the vegetables. And yes, definitely vegetables. 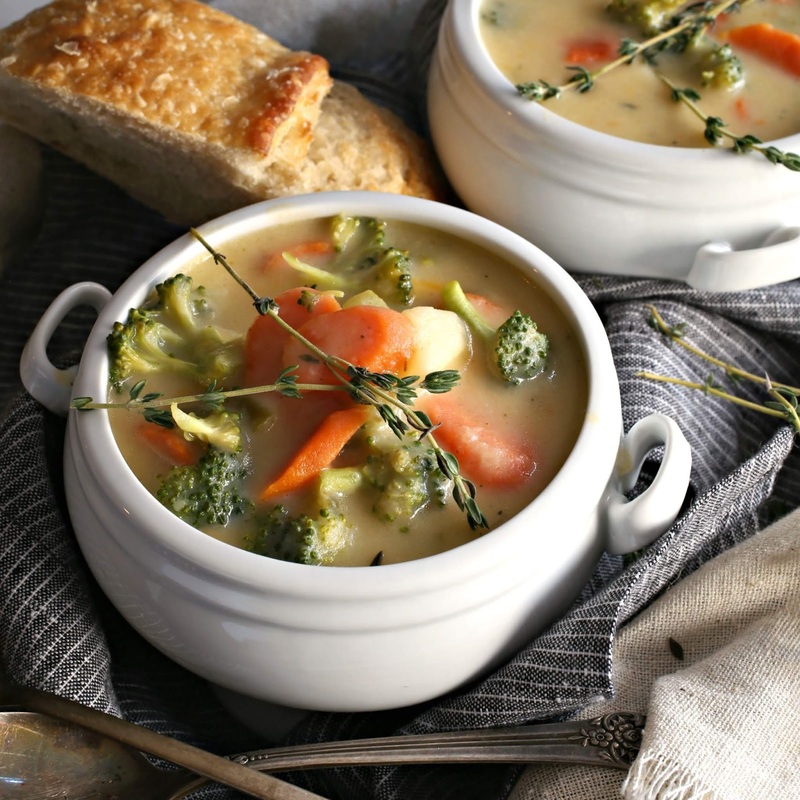 I clean out the veggie crisper drawer for this soup. You don't have to include the cheese but why wouldn't you? And I do highly recommend grating your own. 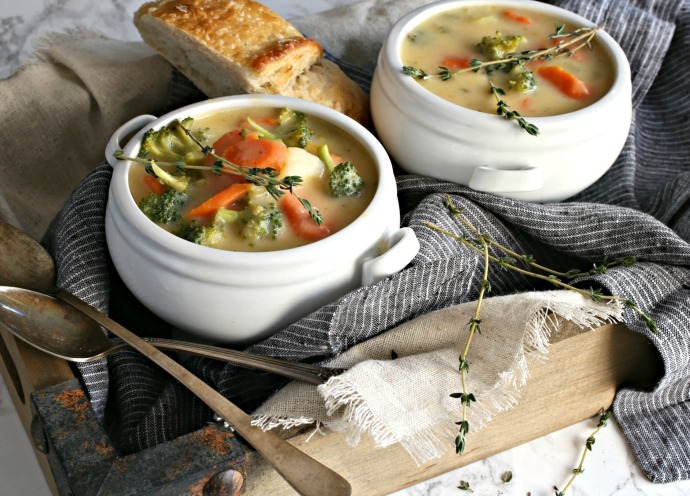 I also prefer the taste of chicken stock but vegetable stock works great if you want to keep this vegetarian. Either way, this is a big bowl of cold weather comfort. Enjoy! 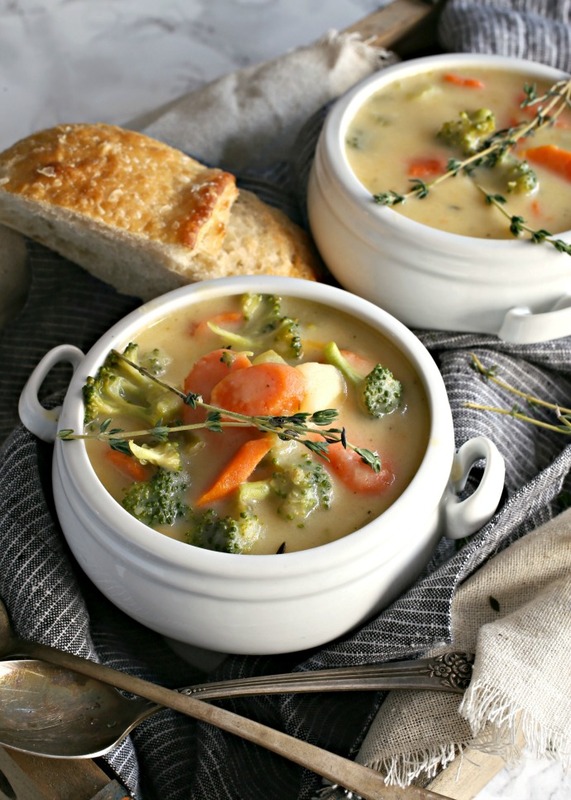 Recipe for a creamy vegetable soup with cheddar cheese. Heat the butter in a large soup pot and add the diced onions. Cook on medium heat, stirring occasionally, for about 10 minutes or until the onions begin to lightly brown. Add the celery and carrots and continue cooking for a couple of minutes. Stir in the flour and cook for an additional couple of minutes to cook out the raw flour taste. Then stir in the stock, making sure to scrape up any bits on the bottom of the pot. Add the diced potatoes, salt, pepper, garlic powder, thyme and bay leaf. Cover and cook on medium heat for 25 minutes. Then add the broccoli and continue cooking for another 5 minutes. Ladle out half the vegetables to a bowl and discard the bay leaf and thyme sprigs. Puree the remaining vegetables and liquid using a hand-held immersion blender. You can also do this in a regular blender. Add the bowl of vegetables back into the pot and stir in the milk and cheese.